Lets talk potatoes…my favorite side dish by far. I love all kinds of potatoes especially creamy mashed potatoes with cream gravy, or brown gravy or just about any kind of gravy…and fried potatoes with onions…and Baked Potatoes loaded with cheese and broccoli…and roasted potatoes with butter and Lawry’s Seasoned Salt…and scalloped potatoes with 5 kinds of cheese…and creamed potatoes with peas…and french fries X-tra crispy…..and hash brown potato casserole…and…. sorry, I was getting a bit carried away there for a minute…but I am back in control now. BTW, all those recipes are in my recipe file under side dishes. Perhaps you remember this post I called Potato Magic several years ago…. : here it is if you didn’t get to see it. I have included the recipe for Potato Magic and if you read a bit further, you will see my friend Miss Marci from Louisiana’s recipe for Louisiana Fries! She tells me that all the old family recipes include Louisiana Fries, right along with Gumbo, crawfish and jambalaya! The two recipes are a lot alike….just the seasonings and the order in which you do the steps. Can I tell you these potatoes are like magic…they melt in your mouth and you can’t eat just one! ???? I like to call this recipe potato magic because I combined different kinds of potatoes, and lets face it, I grew up in the Midwest on a meat and potato diet….comfort food! So any recipe with potatoes is right up my alley! I love potatoes….yes, carbohydrates I know….but once in a while, they simply are just good eating! 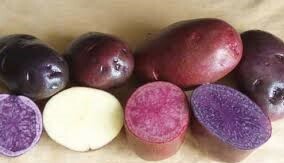 I used purple or blue potatoes which have blue flesh, red rosey potatoes which are kind of a pink flesh, yukon gold which has a yellowish flesh and sweet potatoes. Look in your supermarket to see if you have colored potatoes! They are showing up more and more and are not available only for specialty restaurants. A farmers market may also have the different colors of potatoes. One day, several months ago, I was in the super market and saw the fingerling potatoes in purple/blue, red, and the Yukon Gold (which, by the way I have come to love in mashed potatoes because of their creamy texture) and the beautiful sweet potatoes in various colors of orange. I was experimenting on their different tastes and different ways to prepare and found a solution to my favorite. I mixed them all together in one recipe and called them Potato Magic. Seriously, folks….make these potatoes and you will see the magic and hopefully love them too….The printable recipe is below! AND now lets take potatoes one step further….we are back to today! A friend of mine who hails from Louisiana, read my Potato Magic recipe and told me about her recipe which is similar. She said, most home cooks in Louisiana make this potato recipe. They are called Louisiana Fries! I have to confess that I have not made it yet…and there is one extra step of precooking the potatoes which Miss Marci says can be done a couple days ahead of time and stored in the fridge. But I have to admit, what is not to like about this recipe? The garlic butter sauce? YUM! Thanks Miss Marci for giving me this recipe from your Louisiana family archives. I really enjoy trying recipes from different parts of the country. Ya know….I don’t think I could live without the potato….I can’t help it! Is there a Potatoes Anonymous Group Meeting? If, there is…I should be in it. Do you like potatoes my dear readers? Have a great week-end….excuse me while I go peel a few potatoes. They are not for me…..
Another go to recipe for that wonderful spud. It sounds like a lot of steps but once you go through it...you will see is all falls into place. Peel potatoes and cut into 3/4 inch cubes and place them in a bowl of cold water. Next, melt butter in a medium saucepan, add oil and garlic and simmer until garlic is tender; set aside to cool. Add in chopped parsley. Combine the salt and pepper, onion and garlic powder seasoning and the Creole or Cajun seasoning and blend the spices together in a small bowl. Now it is time to cook the potatoes. Drain potatoes in a colander and place the potatoes in a sauce pan, covering with fresh water. Bring to a boil and cook until slightly tender (about 10 minutes) drain potatoes and place on a paper towel. Meanwhile, preheat oven to 175 degrees F.
In a heavy pot or deep fryer, heat the oil. Add the potatoes, (as you would french fries) frying in batches, and turning to brown (about 3 to 4 minutes). Drain on paper towels and season with the seasoning mixture....then transfer the potatoes to serving platter and place into the warm oven, while you prepare your meal. Leave the potatoes in the oven for at least 20 minutes. When ready to serve, add the remaining seasonings to the garlic butter sauce,...toss potatoes with the sauce and seasonings and garnish with parsley and/or chives or green onions and serve right away. Cubing and boiling the potatoes in advance is a good timesaver when preparing this dish, as they can be held in an airtight container in the fridge for a day or two until you're ready to fry and finish them. 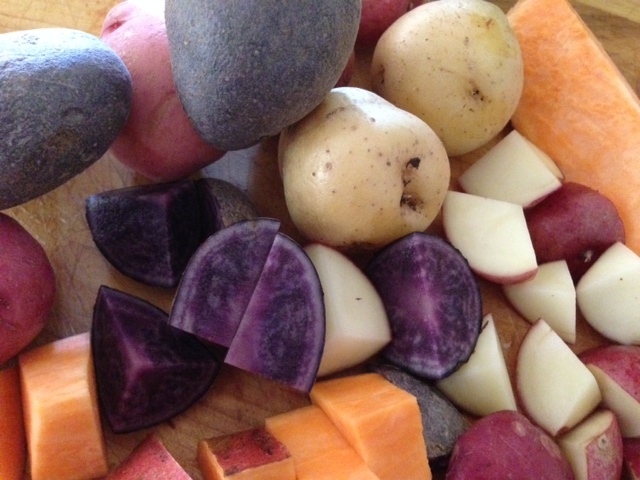 Yukon gold, Purple, Red Rosey Potatoes and Orange Sweet Potato...combined to give you a wonderful potato treat. Use the oven, microwave and on top of the stove. Bake in 350 degree oven for 10-12 minutes, until almost tender, At this point, you can cool the potatoes and store in the fridge until ready to fry, or cool on the counter to use immediately. Drop into preheated deep fryer or a heavy skillet with about 2 inches of oil. Fry until crispy on the outside and creamy soft on the inside. The secret is the deep frying ...these are so yummy! They can be served for an evening meal or for breakfast. If you want to get even more flavor, saute chopped onion in bacon grease and add to the cooked potatoes...Add chili powder for more of a kick. I really like the taste of the sweet potatoes and the purple, red and yukon gold flavors mingled together! Enjoy and experiment with what pleases your palette . You can use a microwave to hasten the cooking or you can put potatoes in non stick skillet and "steam" with a couple tablespoons of water, or par boil them in boiling water. I have made them in the oven, microwave and on top of the stove. « Let Your Table Show Summer is Here…. I can vouch for the fact that this is a truly yummy recipe.